Polar bears are the largest predators to walk the earth – or the frozen sea, as it were. They also are a vulnerable species treading on ever thinner ice as a direct result of global climate change. Polar bears live at the top of the world. They range across the circumpolar north, crossing the boundaries of five nations: Canada, Russia, the United States (Alaska), Denmark (Greenland) and Norway. More than 60% of all polar bears live primarily in Canada. For the record, you’ll never find a wild polar bear and a wild penguin in the same place. There are no polar bears in Antarctica and there are no penguins in the Arctic. Polar bears spend long, dark, freezing Arctic winters at sea. They roam endlessly across the frozen sea ice, hunting seals. They feed almost exclusively on seals and can hunt them only during the winter from a platform of frozen sea ice. Because of their dependence on sea ice and because they spend most of their year at sea, polar bears are classified as marine mammals. Their Latin name, Ursus maritimus, means “sea bear.” It so happens that they are also excellent swimmers. They have been known to swim more than 60 miles without a rest and have been clocked swimming as fast as 6 miles per hour. Living where they do, you would think that polar bears might get cold and uncomfortable, yet they don’t seem to. Over thousands of years, they have evolved to being perfectly adapted to the cold. They have two dense layers of fur and an additional layer of blubber (up to 4.5 inches thick!) Their ears and tail are small, too, which minimizes heat loss. A polar bear is so well insulated from the cold that even when it’s minus 34 degrees Fahrenheit outside, the bear’s body temperature and metabolic rate remain constant! A polar bear has to worry more about overheating than freezing. Even in very cold weather, a polar bear will overheat if it runs too far or too fast. This is why polar bears have a reputation for ambling. By the way, polar bear fur looks white but really isn’t. Each polar bear hair is clear and hollow.  The hollow core scatters and reflects visible light in the same manner as ice and snow. Polar bear fur looks white even though each hair is really clear just as snow looks white even though each crystal is really clear. Beneath all that fur, a polar bear’s skin is black. The skin is rarely visible, though, and scientists do not believe that it helps the bear absorb heat. It had been theorized in the past that polar bear hair conducts ultraviolet light and heat to the skin, helping to keep the bear warm, but this also has been proven untrue. Polar bears are also well adapted to moving and hunting on ice. Their white coat camouflages them against snow and ice, their most common backdrop. Their huge feet make excellent oars in the water and excellent snowshoes on land. The largeness of their feet helps distribute their enormous weight so that they don’t fall through thinner ice and their foot pads are covered in small black bumps called papillae that provide traction on ice. Their long, curved claws are lethal weapons and also help them to grip the ice when walking. 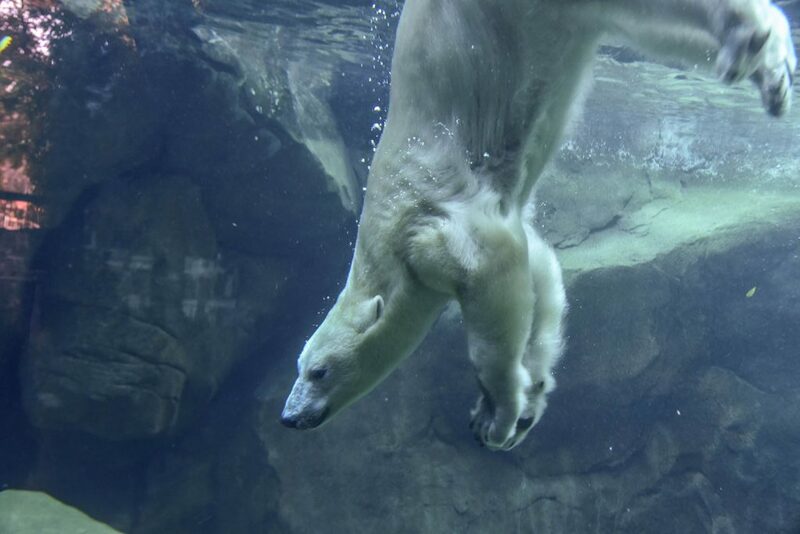 A long neck allows the polar bear to breathe more easily while swimming and to reach down inside ice cracks and breathing holes to catch seals. Large, sharp canine teeth and small, jagged teeth cheek are perfect for ripping and tearing seal meat. To catch a seal, a polar bear must be patient. Polar bears are generally solitary animals that hunt alone. Once a bear locates a seal breathing hole, it will sit there for hours – possibly even days – waiting for a seal to surface. When the seal does, the bear will strike, grabbing the seal by the head with its jaws and yanking it from the water. Depending on where they live, polar bears will try to catch and eat other prey as well, including sea birds and the occasional walrus or beluga whale. But without seals to eat, no polar bear can survive. When spring comes to the Arctic and the sea ice thaws, polar bears retreat to land. There they remain until ice forms again in the fall. While land-locked, polar bears fast. They will scavenge what they can – a whale or walrus carcass that washes ashore, berries, or garbage – but they mostly go without food until they are able to return to sea and hunt seals again. Any top predator in any given ecosystem significantly impacts other species sharing that ecosystem, and this is certainly true of the polar bear. Being at the top of the Arctic food chain, the polar bear influences the survival strategies and behaviors of many other species. Polar bears and ringed seals are especially interdependent, with polar bears depending on ringed seals for sustenance and ringed seals adapting their behaviors to avoidance of polar bears. Arctic foxes and, to a lesser extent, ravens benefit from scavenging polar bear kills. Where polar bears commonly encounter humans – in and around Churchill, Manitoba, the “Polar Bear Capital of the World” – the large predators definitely make a lasting impression. Residents of Churchill have taken significant measures to coexist with polar bears and to build an ecotourism industry centered on viewing bears in their natural habitat without disturbing them. Nothing! (Except man.) The polar bear is the dominant predator in its range and has no predators to fear other than man and, on rare occasions, itself. Female polar bears will aggressively defend their cubs from male polar bears, which have been known to attack cubs. Man is the only true hunter of polar bears. Native Arctic peoples have hunted polar bears for centuries. The harvest from subsistence hunting has never been great enough to threaten the species but the same cannot be said of sport hunting. In 1973, the five polar bear nations signed an historic International Agreement on the Conservation of Polar Bears that put many important protections in place for polar bears, including strict regulation and limitation of sport hunting. A female polar bear gives birth about every three years, most commonly to twins. Polar bears are typically solitary animals, but reproductively active females probably don’t feel this way. After giving birth, a female bear stays with her cubs for about 2.5 years. Once those cubs are old enough to fend for themselves, the mother will separate from them and become pregnant again soon thereafter, starting the whole cycle of mothering over again! She will live almost continuously with cubs until she is no longer reproductively viable. Only pregnant female polar bears den up for the winter. She will dig a maternity den in an icy snow bank and hunker down inside to give birth and care for her offspring for the first few months. When she emerges from the den, she will have been without food for many months and is literally starving. She will head out onto the sea ice as soon as possible to start hunting, with her cub or cubs following close behind. Cubs are entirely dependent on their mothers. They will nurse from her for about 20 months and will learn to hunt and eat by her side. In fact, cubs learn everything about “how to be a polar bear” by watching their mothers and following her lead. Mothers also defend their cubs aggressively from any perceived threat. Mothers with cubs generally avoid adult male bears, which sometimes attack young, but will confront males if necessary. An agitated, highly protective mother polar bear is capable of driving off males much larger than herself! Because of global climate change, the survival of the polar bear is in immediate jeopardy, particularly in the lower Arctic. As temperatures warm and sea ice continues to melt earlier and form later, polar bears are losing their ability to hunt and feed adequately. In May 2008, the U.S. 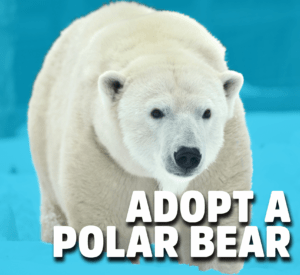 Fish and Wildlife Service listed the polar bear as threatened under the Endangered Species Act, making it the first animal species to win protections because of threats from global warming. This classification is in keeping with that of the IUCN, the world’s leading conservation organization, whose Polar Bear Specialist Group reclassified the polar bear in 2005 as a vulnerable species. Likewise, Canada and Russia both list the polar bear as a “species of concern.” The world is aware of the polar bear’s plight. In order to save the polar bear, the world has only one choice: to tackle and solve the crisis of global climate change. 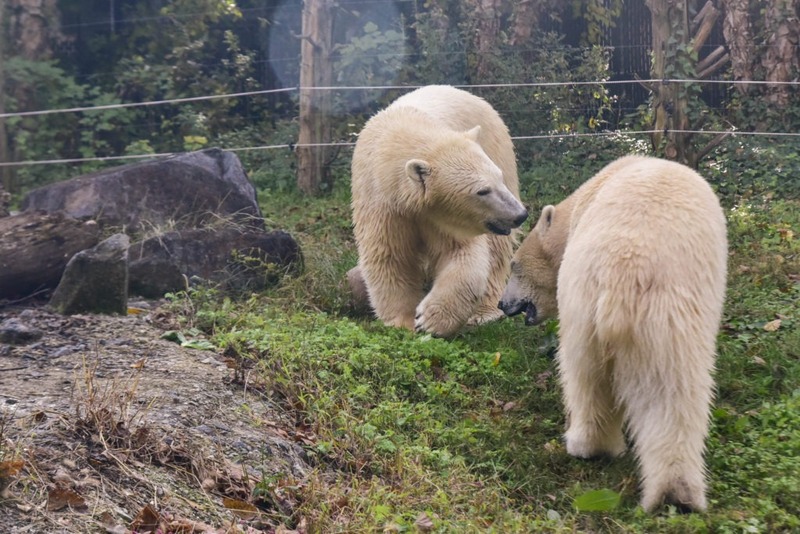 Since the opening of its Polar Bear Watch exhibit in 2003, The Maryland Zoo has maintained a strong collaborative relationship with Polar Bears International (PBI), a not-for-profit organization dedicated to the worldwide conservation of polar bears through education and scientific research. 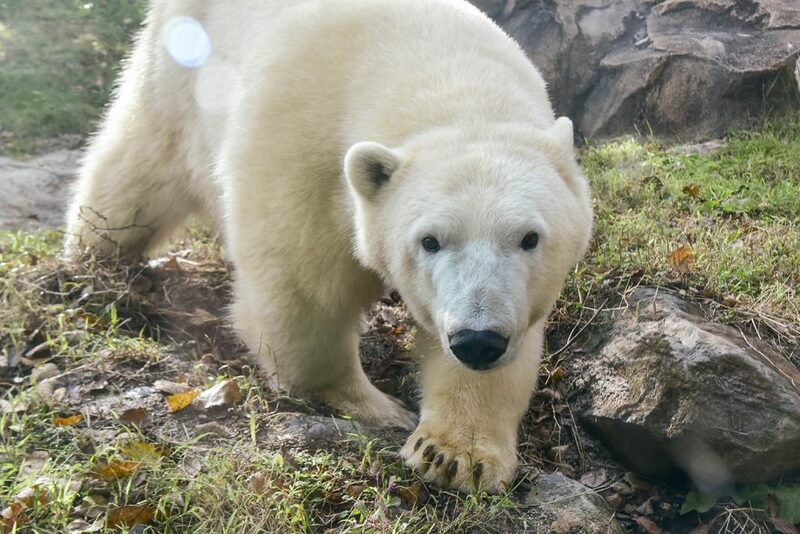 By exhibiting polar bears and other Arctic animals, through signage, and through innovative education programs including the Polar Bear Distance Learning Project for middle and high school students, the Zoo is working to raise public awareness and concern for this magnificent animal. The Zoo is also participating in research studies on polar bears that will add to general knowledge about this species. Knowledge is an essential aspect of conservation, as knowledge is the underpinning of critical debate and decisions that will influence survival in the wild. “Ice Bears,” Zoogram, Winter 2007, pp. 6-7. “Wanted: Polar Bear Experts,” special for The Baltimore Examiner, 3/12/2007, p.30. “Test your polar bear know-how!” special to The Baltimore Examiner, 2/5/2008, p. 25. Fall 2008 Zoogram, “News from the Zoo” spread, pp. 4-5. “Cubs in Winter,” Zoogram, Spring 2009, pp. 8-9.